I was thinking about how all of the other big named paid chat scripts are redesigning there chatboxes, and they have since increased in users. For instance, Intercom reported having almost 1,000 new users the day they released a new chatbox design. Crisp just released their new chatbox design (looks like Intercom's), and they are boosting in users. I would just like something a little fresh and new. Thank you for the submission. We will be starting to work on this quite soon as we finish the design for our new mobile apps. I'm hunting for a place where people have the problems I have and have already solved them. Find this with most everything I work with. I'm using the API JS, have error codes, special use....but I can't find anything to learn from others that have already gone through this. Would love to be able to post and have others in the community help. Once I learn it better, I'd be glad to help others as well. I do on other sites now. We are very happy to hear that we have a devoted community. We are actually starting to look into a community forum where you could do exactly this and more. But this will require time. Under Reporting tab, add visitors and visits. Like you are showing chat volume ,missed chats etc. based on different domain. Please add visitors count of website. Thank you for the idea. We are thinking of expanding reports further in the near future. This is one of the statistics that could be helpful. I've used another chat app that also integrated with Shopify. They had a really useful feature that shows what a visitor has in their cart. They also had the option to trigger a chat window when a visitor would abandon their cart (so cart > checkout > cart = chat window popup). It would also be great to see a sales history of some sort, so you can improvise offering discount codes without having to look up visitors in Shopify. 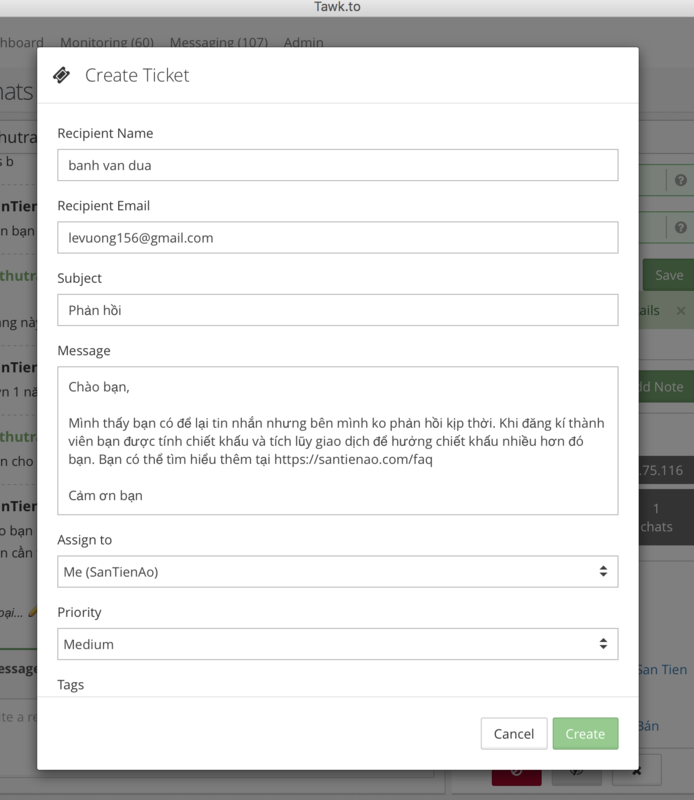 - From the chat window with customer, click Dropdown, choose "Create Ticket" (http://i.imgur.com/B7HmqN3.png), then the form is popup. Thank you for the error submission! We will be looking into fixing it soon. Hello I would like to suggest an improvement: Reduce image size: https://static-v.tawk.to/a-v3-31/images/icons.png through the site tinypng.com to get lighter, this image is not optimized !, and sends it to the platform, we use the app on our website: http://lojahost.net and approved, we are releasing and installing our customers are loving all the features. It will be good if you can change display on multiple chat in same time. Actually, they stuck 1-2-3-4-5-6 chat side by side but its hard to manage it.